Ross Miner trains for the upcoming world championships in London, Ontario. LONDON, Ontario — After taking online courses from the University of Missouri for a couple of years, Ross Miner figures that it might be time for him to actually sit in a lecture hall with classmates and a professor. Most skaters take a sabbatical from their studies during the pre-Olympic year in order to be at the rink, but Miner, who competes for the Skating Club of Boston, has spent so much time inside the ancient Quonset hut by the Charles that he probably could practice blindfolded and not graze the dasher. Since Miner moved down from Williston to Watertown a decade ago, the world essentially has been his classroom. In his six competitive seasons as a junior and senior, Miner has competed in seven foreign countries on three continents and has appeared in Japan so often (five times) that he may be better known in Sendai than he is in Southie. Marissa Castelli and Simon Shnapir, the US champions from the Skating Club of Boston, are looking for a rare US gold at the world championships. The major skating events in the US are held in the same months as the World Series, the NFL playoffs, and March Madness. While the Olympic men’s champion is an American, how many of his countrymen can name the new national titlist? (Answer below.) In the last three years, there have been three different victors, with eight men standing on the podium since 2010. The one constant has been Miner, the only competitor who has made the podium three straight times, finishing third twice and second to Max Aaron at the January championships in Omaha. If he can finish in the top two again at next year’s event at TD Garden, Miner will make the Olympic team for Sochi. All he has to do is do what he does every day on Soldiers Field Road. It is a slippery sport, with anonymous scoring, and the results depend upon the vagaries of the day. Jeremy Abbott, who was bidding for his fourth national crown in five years in Omaha, came in third and missed the team. Aaron, who’d been eighth in his senior debut in 2012, landed two quadruple jumps in the long program and became the most unexpected winner since Rudy Galindo in 1996. But Farris fell on his quad, as did Abbott, who also doubled his final two triples, and Miner found himself as runner-up with an invitation to the planetary party. What upset him was how he performed at the Four Continents in Osaka, where Miner finished ninth after winning the bronze a year earlier in Colorado Springs. 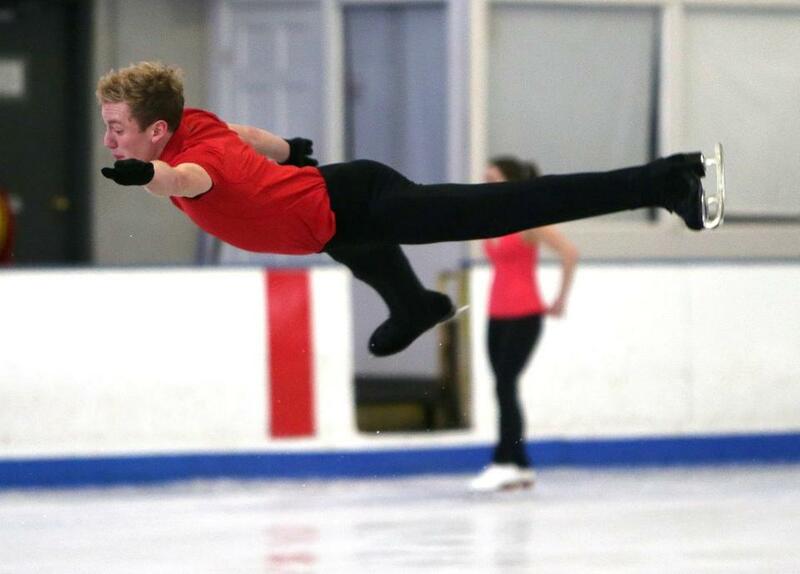 “I was pretty disappointed with the way I skated, to be honest,” he said. “ “I definitely came home with a little bit of fire in my belly to change some stuff,’’ he said. What he hasn’t changed are the programs designed by new choreographer Tom Dickson — “Rhapsody on a Theme of Paganini” for the short, “Captain Blood” for the long — or the content, which calls for one quad in each program. Though most of the top contenders have two in the long and Spain’s Javier Fernandez, the European champion, has three, Miner won’t be tempted into aerial escalation. As the Winter Games approach, the stakes get higher and the squeeze more intense. The world placements will determine each country’s entries for Sochi, and if Miner and Aaron can land what they’ve planned and both finish in the top seven in Ontario, the US will retain the third berth that it has had since 2002. Miner has learned he only can control what he does when the music is playing. Two years ago, he thought he’d be going to Tokyo for the World Championships. Then the earthquake and tsunami hit. The championships were moved to Moscow and held a month later, and Miner finished 11th, Last year he missed making the team by one place behind Abbott and Adam Rippon, so punching his ticket for a return trip in the pre-Olympic season was both satisfying and redemptive. But he understands that there is a world beyond the Worlds.